The Bee loves to practice cutting with scissors but it is definitely a skill she is working on not one she has mastered, so she often get frustrated with the cutting and it stands in the way of what she really wants to do, make collages. She loves gluing the cut papers on top of each other! So the other day at the book store of all places, I saw these scissors and had to get them. These scissors are made by Faber Castell and called My First Scissors. With no finger holes you cut by squeezing a motion that is a lot easier for little hands! They also can be used by righties and lefties! 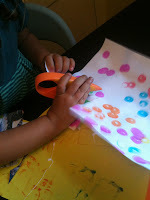 The Bee finds these scissors a lot easier to use and since we got them she has really enjoyed making collages.